Improving the stewardship of land and water is the purpose of the Dubois County Soil and Water Conservation District. All landowners rural, town or city are members. Tuesday night many of those land owners elected Glenn Goeppner for another three years on the board. Glenn Menke was re-appointed to the SWCD Board and was sworn in on Tuesday night. Menke feels the SWCD serves the county with training. The meeting also featured the presentation of the Otto J. Bauer Conservation Farmer of the Year Award given to Dustin Schmett. The O-F-S Forest Stewardship Award was handed to Tom and Louise Brames. Roger Sermersheim was recognized as the Dubois County’s 2018 River Friendly Farmer of the Year. A new award was introduced. That award, the Friend of Conservation Award was presented to Alan Smock for outstanding contributions to soil and water conservation in Dubois County. Finally, the Ken McWilliams Award for Soil Judging Excellence was presented to the Jasper High School team. They scored highest at the SWCD/Purdue Extension Soil Judging Invitational. The SWCD appreciates the support of many in the community including county government. County Council Woman Charmian Klem who also serves as the council’s liaison to the SWCD knows the importance of soil and water conservation. Bruce Kettler, Director of the Indiana State Department of Agriculture was the keynote speaker giving an update on agriculture in Indiana. The Dubois County Soil and Water Conservation District is chaired by Brenda Sermersheim and Judi Brown is the executive director. 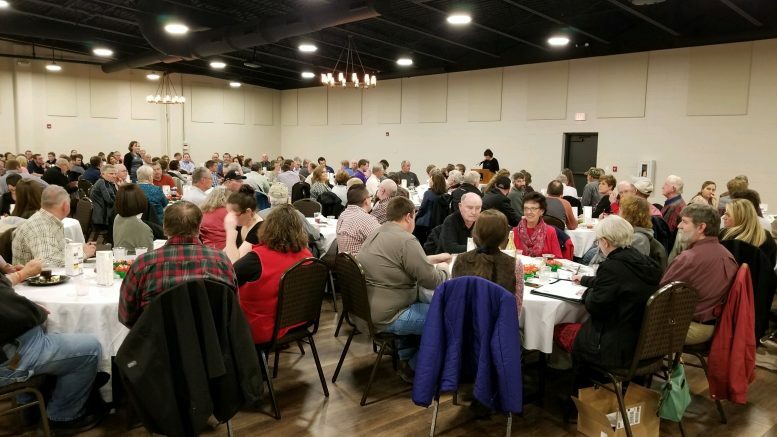 Be the first to comment on "Dubois County Soil and Water Conservation District Annual Meeting Held"